The Purchasing Department has engaged in considerable outreach efforts to inform the campus community about recent significant developments in the State law related to procurement. One of the most concerning topics for the campus community is new criminal provisions related to “Gratuities and Kickbacks”—the acceptance of items of value from vendors and others interested in selling items to the University. This article offers an overview of the major points to be aware of under the new law. Procurement Participants: employees preparing for, administering, conducting, or making decisions regarding a procurement process; those making a recommendation/award regarding a procurement contract or decision to obtain a procurement item from a particular party; and those evaluating a bid, quote or response during a procurement process. Procurement Contract Administrators: employees who administer a current procurement contract including making payments, ensuring compliance with the contract, auditing or enforcing the contract. If you are currently engaged in either of these roles, then the prohibition on gifts and gratuities applies to you and your family members. 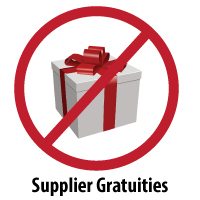 This means is it unlawful for an interested vendor to give you a gift and for you to accept the gift. “Gift” includes travel, meal, lodging, money, loan, entertainment tickets, etc.—regardless of the value. There are some exceptions. First, there is a very narrow exception for “hospitality items” valued at less than $10. Hospitality items include a pen, stationary, toy, pin, trinket, snack, nonalcoholic beverage, or appetizer. It does NOT include a meal, money, ticket, admittance to an event, entertainment, travel or lodging. Hospitality items may be accepted from a vendor as long as the value of hospitality items from one vendor does not exceed $50 in one year. It is lawful for a vendor to provide a voluntary donation to the University for the University’s use. This includes donation of money, services or other items of value. It is also permissible for a vendor to provide to the University admission to a seminar, supplier fair, charitable event, fundraising event or similar event that relates to the function of the University. It is also lawful for a vendor to sponsor a University event or for a vendor to purchase a booth at an event sponsored by the University. In general, we recommend that the best practice is to separate those engaged in procurement activities and administration of procurement contracts from those engaged in development and other activities involved with donations/contributions. By clearly differentiating these roles and having separate employees fulfill these duties, it will alleviate the potential for the appearance of a violation of these new criminal provisions. We recognize that the criminal nature of these provisions enhances the concern of employees and Departments. If there is any question about the propriety of any conduct, please don’t hesitate to contact the Purchasing Department or the Office of General Counsel for further guidance. Title 63G Chapter 6a Part 24 Unlawful Conduct and Penalties. Title 63G Chapter 6a Part 5Section 506 – Small Dollar Purchases (dividing small procurements).